Earn $3.50 in VIP credit (350 points)What's This? Ride fast and with less friction. 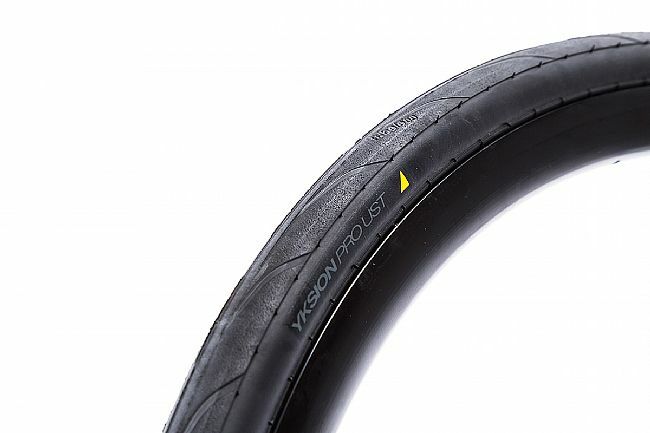 Gripping the road tighter and giving you the crucial protection that you need to make gains on the road, the Mavic Yksion Pro UST Clincher Tyre is the tubeless tyre for riding fast. Lightweight at just 290 grams in a 28mm iteration. Pairing perfectly with Mavic's UST wheelsets, these tyres are responsive, strong, and ready for your next adventure. Low rolling resistance and extra speed thanks to UST tubeless technology. 11 Storm rubber compound reaches the best balance of grip and low rolling resistance. Improved comfort with high flat protection. Available in 2 widths: 25mm and 28mm. Guaranteed match for Mavic's UST Wheel-Tire system. Kevlar bead stretches just enough for easy mounting. These are fast tires, but I swear you'll get a puncture from pretty much anything. I rode probably 4000 miles on Conti GP4S tires before these and got a single puncture. I rode under 1000 miles on these (on mostly the same roadstrails) and I had maybe 50 punctures. Most of the time, they sealed up fine, but the crazy frequency of punctures resulted in like 5-6 times where I had to add air to the tire. Eventually, some previously sealed punctures started blowing out on a regular basis. Even if that didn't happen, I have serious concerns about the longevity of these tires - if you get too many punctures near each other, I doubt these will hold up. 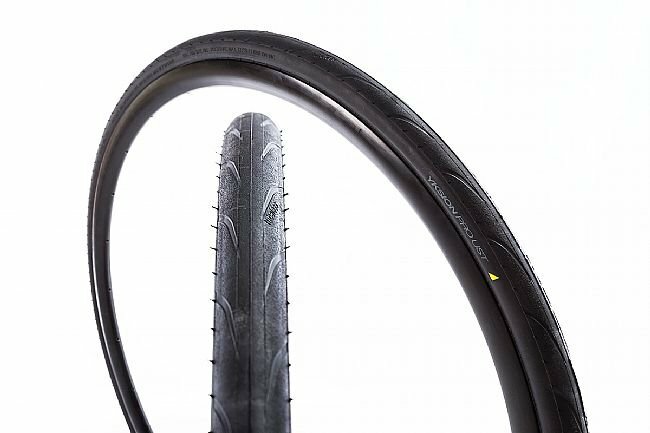 Until there's a viable tubeless tire that can actually resist some punctures (I'm not yet sold on the GP5k), I'm going to ride tubes on my tubeless wheels. I have had these on Cosmic Carbon UST wheels for about 10 months now. The front tire is great, no issues and no cuts! The first rear tire suffered a full thickness cut all the way from bead to bead so I can't really say that any tire would have fared better but the one I bought to replace it has been problematic. It's worn very quickly and has had so many little cuts that the sealant is constantly oozing. I've also seen bubbles of air that collect under the compound of the tire, as though air can track out of the space between the rim and the tire and actually collect in between the layers of rubber. I would also add that the set up is not really as easy as it looks in the video! I have used Conti GP4000s for years and this is the first tire I like better. It has better ride comfort and better grip. The downside is it cuts easily.In addition you must learn some new techniques to get it mounted. The initial bead must be centered in the rim and then you should chase the other bead around the rim until you are able to mount it with your thumbs. A Joe Blow Booster pump (or similar) is required to pop the beads onto the rim - a normal floor pump won't work. A proper amount of sealant is necessary for optimum performance. The increased safety of tubeless technology is worth the hassle.